The Volunteer Work Weekends are a unique way for the Chalfonte to prepare for a new season & for her to rest for the winter. As today, the early volunteers were Plumbers, Painters, Electricians, and Master Gardeners bringing their individual talents to each project - all for the grand old Hotel in a beautiful seaside resort! No season can be complete without the support from our Work Weekend Warriors! Our sincere gratitude to everyone&#39;s hands, strength, perspiration and paint splatter that have been contributed over the years. 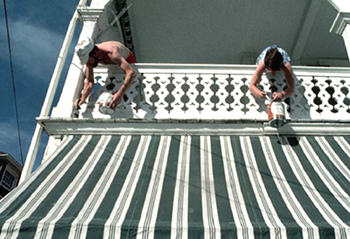 Closing the hotel is the exact opposite of opening: removing awnings; end of season repairs; cleaning & closing up. We provide 2 nights’ accommodations in the hotel and meals from Friday dinner to Sunday lunch in exchange for ten hours of labor, six on Saturday and 4 on Sunday. Participants must be 18 years of age. ALL PARTICIPANTS MUST REGISTER. TO REGISTER: Send an e-mail to info@chalfonte.com with Work Weekend as the subject. Please provide your full name, a telephone &amp; email contact. We look forward to hearing from you!